Carbodiimides play an important role as condensation agents in the synthesis of polypeptides, polynucleotides, polysaccharides and numerous other chemical transformations. 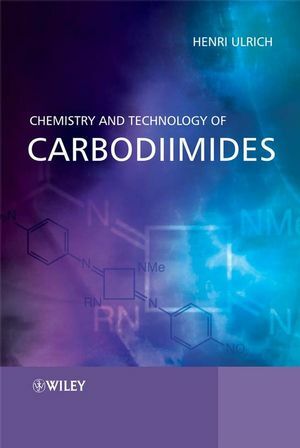 Chemistry and Technology of Carbodiimides is the first book to examine both the chemistry and technology of carbodiimides. This book provides a comprehensive and in-depth coverage of the synthesis and reactions of this industrially important class of chemicals while focusing on industrial applications, including the $M-sectors of biochemical synthesis, pharmaceuticals, polymers, ceramics, and herbicides. Written by a well-known authority in the field this book will prove a valuable reference tool for anyone working in this area of chemistry. Dr. Ulrich is well known as an outstanding expert in heterocumulene chemistry in general, in particular dealing with isocyanates and carbodiimides. He is also well known for his important contributions to polymer chemistry, in particular from an industrial point of view. Coming from industry his work is focused on synthetic chemistry and practical applications rather than theoretical considerations. 5. Acyl-, Thioacyl- and Imidoylcarbodiimides.